petition: Let's Make Sure Every Citizen is Able to Vote. Implement Automatic Voter Registration Now! Let's Make Sure Every Citizen is Able to Vote. Implement Automatic Voter Registration Now! The idea is simple: We live in a democracy, so every citizen should be able to exercise political power by casting a ballot during elections. In a system like ours, making sure every single eligible person can vote and make their voice heard should be of the utmost importance. But right now, more than 20% of eligible citizens are not even registered to vote. How can that be? It's because, in most of the country, voter registration is something that people have to "opt-in" to — meaning that they have to purposefully go out of their way to find the proper paperwork, fill it out, sign it, mail it in to an official office location, and wait to receive confirmation that their registration went through. You might think that once you turn 18, or become a naturalized citizen, or go to college, you're just automatically registered. But sadly, that is NOT the case. But now, individual states are trying to change that. In the past three years, thirteen states and D.C. have approved "AVR", or automatic voter registration. 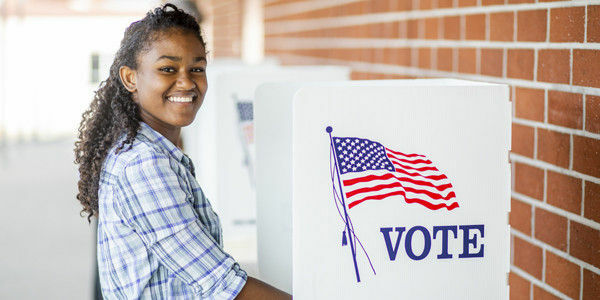 Under this policy, when an eligible citizen interacts with a government agency, they will be registered to vote or will have their existing voter information updated, unless they opt-out. This is a huge deal. After Oregon implemented AVR in 2016, their rate of registered voters grew by 400%. In Vermont, their rates jumped 62% in just the first six months alone. We need AVR for the whole country, so that all eligible voters can be registered quickly, easily, and efficiently! Everyone should have the right to vote. That's why you might see people standing out on sidewalks or running around at the county fair with clipboards, trying to encourage people to sign up — because it's important, and it's our civic privilege and sacred duty. Registering to participate in our democracy should never be a "special," out-of-the-normal-routine thing we have to go out of our way to do. Why should we ever have to manually register to vote? That's ridiculous and outdated! We need to make voting EASIER, not harder. We need automatic voter registration throughout the U.S., now!